This scan was found on the back of Sega's 1993 autumn catalogue. The screen used is a mock shot, and very different to the final game. 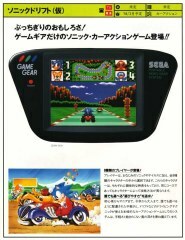 Heres a small English preview of Sonic Drift, with a couple of prototype screenshots of a later version than the above.